Today I have two marvels from Houston, Texas- the Lark of the Border first, I think. If you and I could be there together, right now, looking at this painting, I would not say a word. I would set there in the hush that the painting demands. We'd hover there, betwixt looking and feeling, thinking that it might not be true. That it was the truest untrue truth of e.e. cummings' poem*. Later, we might go outside, into the heat and the growl of the cicada-clicking late afternoon. There, in shadow, we might break the spell of it: speak of the glorious shifting light from the scrim veiled ceiling; gasp together at the size of it; was it 12 feet high? 50 feet long? I might confess to you how I was overtaken by a glimpse through the doorway; transfixed by the gaping, glowing orbs. We would marvel at how it simmered and hummed in the palpable light of the gallery. We would promise to make another pilgrimage to it, and we would be so... so happy to think that there were things like this to see. Here is Say Goodbye Catullus to the Shores of Asia Minor in situ, with its painter, Cy Twombly. 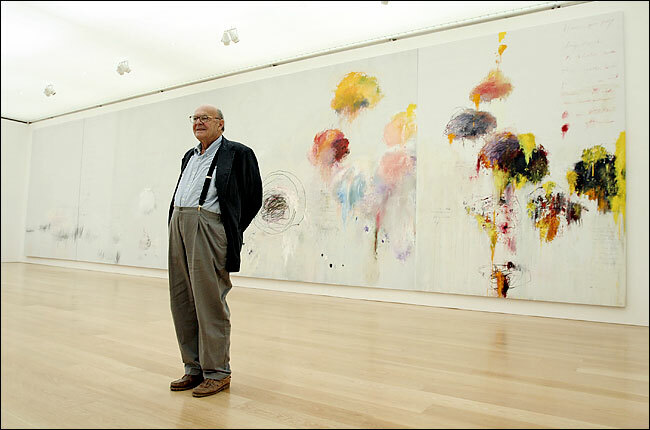 See many more lovely Cy Twombly paintings and sculptures here. Let's have just one more Lydia Mendoza song too, don't you think?